The Bureau of Labor Statistics, the government in general, economists and industry leaders have been proudly proclaiming the “low” 4.something percent unemployment rate. To hear the official dogma, unemployment is a non-problem. And they may be right. Because the real job market problem is underemployment not unemployment. This helps to explain why wages are remaining stubbornly flat since the Great Recession ended, why jobs seem so hard to get, and why something just doesn’t feel right. Even though most of the population seems to be employed – at least those who want to be – we still seem to be struggling with some sort of undeclared malaise. And that’s eight years into an economic recovery. It makes you wonder what will happen when the next downturn hits. It’s often been reported that one of the major reasons why the unemployment rate is falling is because people are dropping out of the labor force. No one is exactly sure why this is. Theories include people taking early retirement, young people staying in school longer, and more people on disability insurance. A more recent theory puts the blame on – are you ready for this? – videogames. A study released in 2017 found that 15% of men between 21 and 30 were neither working nor attending school full-time in 2016. That’s almost double the 8% rate in 2000. We can blame the apparent laziness of twenty-something males. We could even blame the increasing attractiveness of the video games themselves. But is it also possible that the games serve as an escape hatch for young men who feel increasingly excluded from the workforce? Whatever the reasons offered for the decline in the labor participation rate, it is a real thing. 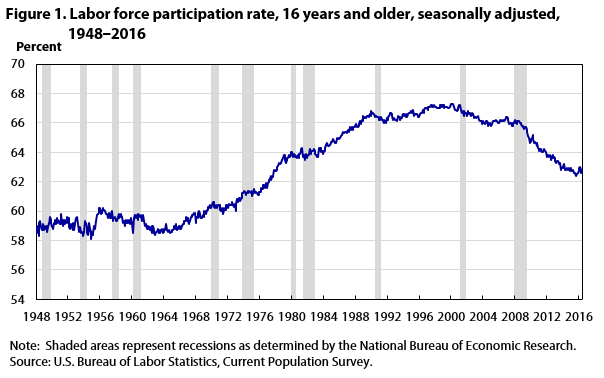 After hovering around 67% through much of the 1990s, and peaking at 67.3% in 2000, the labor participation rate in the US has been on an almost steady decline. It’s currently down to 62.7%. That means that even though there are more people working than there were in 2000 – because the population has grown considerably in 17 years – the actual rate of employment has declined by 4.6 percentage points. Let’s take a stab at defining the various factors that are contributing to underemployment. 17.9% of the workforce is employed on a part-time basis in 2017. This is down from the high of 20.1% at the height of the Great Recession job market trough in 2010. But it’s higher than the 16.6% recorded in 2000, and well above the 13.5% in 1968 when the labor department began recording part-time employment statistics. Part-time work is defined as working less than 35 hours per week. 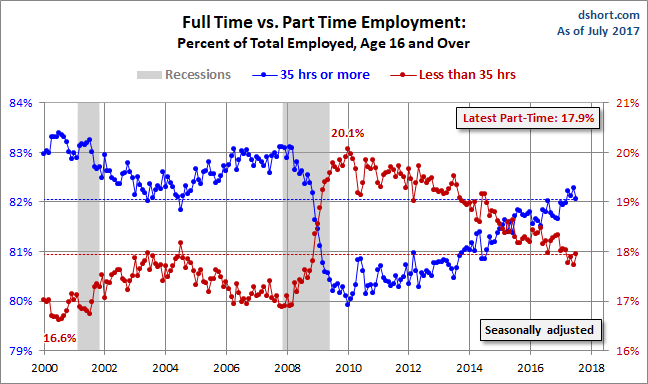 More than one out of six workers in the US works only part-time. And that’s eight years into a statistical expansion in the economy. We can only imagine how high that percentage will go in the next recession. Social Security Beneficiary Statistics reports the number of people collecting disability benefits stands at over 10.6 million. This compares with just over 4.4 million 30 years earlier in 1987, and over 6.6 million in 2000. That represents a 240% increase since 1987, and 60% just since 2000. By comparison, the population has grown from 281 million in 2000 to 325 million in 2017. That’s an increase of 44 million people, or 15.6%. In other words, while the total population grew by 15.6% from 2000 to 2017, the number of people collecting disability increased by 60%. It’s widely speculated that unemployability, rather than strictly disability, is the reason why the number of people collecting benefits has risen so rapidly. Is it possible that the government is lowering the bar to accommodate economic “disability” as a means to reduce the workforce, and thereby unemployment? If so, is this a backdoor response to an employment obsolescence trend that’s never declared? Free thinkers should dare to consider as much. A 2016 research report out of Princeton and Harvard Universities found that the number of contract workers in the US has been rising rapidly in recent years. The Rise and Nature of Alternative Work Arrangements in the United States, 1995-2015 found that contract work arrangements have increase from 10.1% of the workforce in 2005, to 15.8% in 2015. That’s a gain of more than 50% in a decade. There are all kinds of reasons for the dramatic increase in the number of contract workers. And all of them benefit the employer, not the employee. For starters, contract arrangements end any notion of employment security. The arrangement is completely at-will. The employer can terminate the employee at any time, and without severance compensation. What it all means is that contract workers are only marginally employed. A contract worker may be earning $1,000 per week, which sounds impressive on the surface, but has no benefits, must pay his own income and FICA taxes, and can be released at any time without notice. Having been a contract worker myself, it’s a game I fully understand. Let’s get back to that BLS underemployment number of 9.2%. If 15.8% of the workforce are contract workers, 17.9% work part-time, and 4.5% are outright unemployed, that produces an underemployment rate in excess of 34%. It also means that the BLS’s 9.2% rate of “marginally attached workers” dramatically understates the magnitude of the problem. In fact, let’s call it what it really is – a complete farce. A figure of 34% goes much farther in explaining the real job market problems. That is, why wages are flat, and why jobs are still so hard to get after an eight-year expansion. Why go through this exercise? Because reality is always more important to us as individuals than the happy spin that the officialdom wants us to believe. We live in the real world, not a make-believe world of padded statistics. If underemployment is running at 34% – or anything close to it – that affects everyone. Unless you are in the top 10% of workers who are well employed, the high rate of underemployment is affecting you. We could even break it down by saying that 34% of the population is underemployed, which is having a negative effect on 56% of the workforce, while 10% are so well insulated that they don’t even believe that it’s happening. If you’re in that top 10%, then none of this applies to you. At least not right now. But for the 90% who are affected by it, or for any of the top 10% who see the potential, I have some suggestions. Let’s start with this admission: labor is being systematically devalued in the 21st Century. If you don’t believe that then you’re doomed to be run over by the trend. Technology is providing the means, and the need to remain profitable in a saturated business environment is providing the motivation. Employers must cut costs in order to survive, and payroll is their biggest cost. That means that the trend isn’t likely to improve, and will certainly get worse when the economy turns down. Enough whining. Let’s talk about what we can do about it. The best strategies are the ones that aim to find specific niches in the job market, or to exit the market entirely, and cut your own path. Self-employment. A person who can sell his or her services to the general public doesn’t need a job. That means that self-employment is the ultimate career solution. You don’t have to get fancy, or invest a lot of money either. 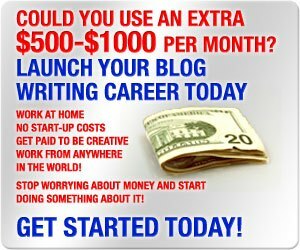 You can do something that’s within your skill set, such as what I did with freelance blog writing. Identify your own skills and talents, and find a way to sell them on the open market. Work for small employers. When you work for a large organization, you’re a number on a chart. And chart line items are destined to be reduced. But when you work for smaller businesses, you’re there to do a hands-on job that needs a personal touch. You usually won’t make as much money as you will with larger companies, but it’s a way to remain employed, while developing very relevant (and highly transferable) skills. Working in part-time jobs with health insurance. Sometimes the best way to earn a living is doing it from several sources. We’ll get into that next. But a part-time job can form the basis of that income arrangement. It’s even possible to get certain benefits, such as health insurance through a part-time job. Investigate the possibilities; you may be surprised at what you find. Doing gig work. This is almost a form of micro-contract work, but it has more of a self-employed flavor to it. Gig work can encompass everything from a part-time job, to supplying specific skills to businesses and individuals, to creating your own side business. Become adept at gig work, and you may never need a traditional job again. Creating multiple income sources. This is about creating income streams from various channels. It can include a part-time job, gig work, or running your own business. There’s even a title for it now – mobile creatives. As a mobile creative myself, I can tell you that’s an excellent way to make a living, once you get rolling with it. I recognize that many of these strategies will take you out of your comfort zone. But so will a bout of unemployment, and the need to find a new job, or create an entirely new career. Unemployment may be “under control” at the moment, but that’s only because the bigger picture problem is being ignored. Underemployment looks like it’s here to stay. The only rational course is to attack it head on, with every intention of coming out ahead. Do you feel the heat of underemployment in your job or career? Where do you think this will go in the future? Some of my story. I worked for my state for 25 years as a correction officer. I was very fortunate to be able to retire at 25 years no matter my age. I found out quickly that I was not qualified to do anything else except have a low wage job with a 25 year old boss. ( No thanks ) I started my own business from scratch. I’m four years in. I could not imagine having a job again where I had to answer to anybody. I will not hire anybody. New York has so many insurance laws that it is not worth hiring anybody. Between workers comp, and everything else I’m required to have it would bankrupt me. I hire independent contractors if I need to have anything done that is out of my zone of knowledge. I have to do this to survive. New York is not business friendly. I don’t care what they say. The laws prevent me from expanding or employing anybody. I keep things small and maximize profit. This contributes to unemployment. Especially when they raise min. wage laws. It actually forces businesses to hire less. With all the stupid laws that some of these states pass they actually contribute to unemployment. It did in my case. Hi Tim – You’re preaching to the choir here. I agree, the whole country is no longer small business friendly, but especially New York (and California, and Illinois, etc., etc.). It’s pathetic but the rate of self-employment in the US is now a lot lower than in other developed countries. We do lip service to free enterprise, but the whole economy is run by government and corporate oligopolies. I’m with you, I run a one man shop and sub out when necessary. No employees, and don’t plan to ever have any. I know a lot of people who are operating the same way. Hiring employees is an albatross. Government has no interest in eradicating un/underemployment, otherwise they’d take the shackles of regulation and taxation off of small business, get out of the way, and let the elevator rise. Meanwhile, the non-self-employed public mistakenly associates small business with big business, which they perceive as evil. They’re right about big business, but their disdain for self-employment in favor of “jobs” is self-destructive. On the brighter side, I think more people are becoming self-employed, but as solo-practitioners like you and me. That’s good news because we’re not competing for jobs. But the bad side is that we aren’t creating jobs by hiring either. I have no idea what it will take to wake this country, its politicians and its citizens out of this stupor they’re in. But it sure makes for interesting subject matter to write about and discuss, don’t you agree? I could go off on a tanget here but I’ll refrain. I have a whole other angle also besides that which I said above. That’s for another day. I’m anxious to hear it. Send it in an email when you get the time. Thanks. Ken, you hit the nail right on the head when you wrote, “Let’s start with this admission: labor is being systematically devalued in the 21st Century. If you don’t believe that then you’re doomed to be run over by the trend.” It’s sad to see in America, but it is true that labor is being seriously devalued, and businesses can’t afford (or won’t afford) the salaries and benefits that employees need. We’re sadly seeing our good jobs outsourced to employees outside of the country (it’s happened to me, too), or being replaced by automation, machines or robots, because machines and robots don’t require salaries and benefits. A sad state of affairs, but indeed a time for employees to get “creative” and have multiple sources of income. Hi Paula – Yeah, I feel like this is a gloomy subject to take on, but there’s so much giddiness out there with the low official unemployment rate that a different position is needed. The economy MAY be growing, but it’s doing it without workers. That’s part of why the stock market is doing so well – job reductions are lowering costs, which is increasing profits. So while everyone’s cheering on the higher stock market, it’s costing millions their jobs. Agreed, that creativity is the only answer. People are going back to school to retool, without realizing that colleges are a decade or more behind the trend. I think everyone has inner creativity, but it isn’t encouraged by the school system or by employers. What I’ve found is that once you unleash your creative juices, they keep flowing. I even suspect – and I’ve heard from others – that our inner creativity is where we’ll ultimately find our best occupations. I wish more people would recognize this reality, instead of pursuing an implied security that doesn’t really exist. But it also goes to show how we’ve all become trained ponies, not only doing what we’re told, but scared to even think any other way. I SO agree with what you’ve written, the comments and replies following. I think that labor in America is being devalued because (another thing the general population doesn’t realize) is that many companies in America today aren’t even owned by Americans. They are owned by foreigners who may or may not live in America. These foreign owners may not have the same values as American business owners and/or may be under the influences of their own governments’ policies or feelings about the population or workers in general. Hence, Americans are more prone to just go along and do what they’re told instead of tapping into their creativity. Also, schools are eliminating subjects such as art, music, theater, shop, P.E., and creative writing due to “budget cuts”, so students aren’t getting the opportunities to even get a taste of something creative that they may like to pursue further. We’re losing generations of great athletes, artists, musicians, writers, actors, woodmakers, sculptors, models, graphic designers, etc. We may never again see the likes of the artists, musicians, and writers, etc., that our generation grew up with, and the industries that promoted them and supported them. You’re also right when you say that colleges are about a decade behind the trends. So anyone wanting to pursue these avenues, or any avenue, that will really make them money or keep them employed, will really have to be creative to find the training and resources to be able to do so. Thank God for the internet where information is shared freely and people can learn a variety of things and be inspired to do great things! I’ve told you about the woman and her children who left an abusive relationship and learned to build their own home from the foundation up through YouTube videos! Awesome and truly inspiring! And, look at you, writing your blog to inform and inspire people, and earn money! So, on this note, I know there is still hope that people will find creative ways to stay afloat financially, tap into their creativity, probably born of necessity, and rise above circumstances and this dreadful job market of underemployment and unemployment! If nothing else, at our core, Americans are resilient, smart, talented, and triumphant! Cheers! All that you’ve written is true Paula. The corporations are loyal to no country, which makes sense given that the largest are multi-national. But they manipulate the public to believe otherwise by making heavy use of patriotic symbols like the American flag. Maybe out of a misplaced sense of patriotism people fall for the manipulation. Look how WalMart bedecks their stores in American symbols, particularly the flag, while having most of their merchandise manufactured in China. So while Chinese workers get the jobs, and the corporate chieftains reap the riches of company profits, the American “patriot” gets access to cheap stuff, while the flags make him proud to be an American. But he never understands how he’s being played. Meanwhile the school system is doing its best to squash the last vestiges of self-expression. But then – another point the average person doesn’t grasp – the purpose of the school system isn’t so much to educate, but to indoctrinate. They’re teaching kids how to be compliant within the corporate/government system, rather than teaching them how to think and to use their talents. Rather than teaching them how to live in an open world, they teach them the group think and political correctness that’s required by the system. It leaves graduates unable to function outside the system, which is really crippling when you think about it. And what do John and Jane Q. Citizen say to that? We need more education. Indoctrination cycle complete! Despite my warnings of all these things – and I’m hardly the only one who sees all of this – I’m optimistic about the long-term. I have faith in God to triumph over all things, believe that human ingenuity is irrepressible, and that the internet has opened up channels and opportunities that won’t be closed. But we have to be aware of it all, and be proactive in moving out of our comfort zones to take advantage of it. It’ll take courage of course. Or desperation. But I think it will all work out. Agreed. May Heaven help us all! Some of that may be possible but coming from a small factory town that got hollowed out in the 90’s I can tell you what happened. Back then they actually did provide money for additional training and many people took advantage but there were still only so many jobs available. Most young people left but older people who had been working hard in factories had the time to pursue disability because they finally had time to seek treatment. Before they would have continued to drag themselves to hard jobs and ignored the pains, the issues and continued to suffer I’ll health. Not in a romantic salt of the earth, work no matter what but in a tragic die a few years after retirement way. I think you have a good understanding of how there are many circumstances that affect people but I implore you to stretch just a little further when you make comments to understand that trends may come about in multiple ways. Hi Linda – Let me clarify the point I made in the article. The government began considering “economic disability” as a factor in awarding disability benefits. If a person is considered to be unemployable – whatever that means – it weighs in favor of an award. And yes, government has used various policy manoeuvers to lower unemployment, including encouraging college attendance by young people, delaying their entry to the job market, and instituting early retirement (at 62) to encourage older workers to make an early exit. None of that reflects bias, it’s just the way things are. That said, I get what you’re saying about post-industrial communities. I live in one and see it all the time. People who held long careers on factory floors find it difficult or impossible to retrain into today’s jobs. Fortunately here there are other jobs. But I understand that in many cities in the “rust belt” there are no jobs, period. We’re both right in that we see the results of underemployment, but maybe from different angles. Rest assured the government is employing different but very subtle strategies to deal with it, short of admitting to the magnitude of the problem. Their “job” is to cast the impression that “all’s well in the land”, but we do have a few “pesky, minor problems” to deal with. They aren’t pesky and minor to the millions who live it every day, in the face of other subtle policies that enhance the wealthy. It’s all inter-connected.